Side op to collect a weapon blueprint. I sneak up to the compound, scope it out and find an entrance I like on the left side. I pick a lock and crawl around the one guard and sneak past the security camera. Using darkness to my benefit, I work around the building, taking out a sniper with my own suppressed tranquilizer sniper rifle. I all but walk around a pair of guards, head up stairs and get my blueprint. Halfway done. On the way out, a guard notices something so I hang off the ledge and he climbs the stairs. I drop down and sleuth my way out of the compound without anyone noticing anything. Perfect stealth. Side op to rescue a hostage. Sneak in and order Quiet, my sniper buddy, to take out an enemy via a tranquilizer shot. But, oh! the enemy is wearing a helmet. The ding off the helmet alerts the entire encampment and they immediately notice me. What ensues is two minutes of tranquilizer shots resulting in about 20 enemies passed out around the base. I get my hostage and extract him. Which is the correct way to play this game? 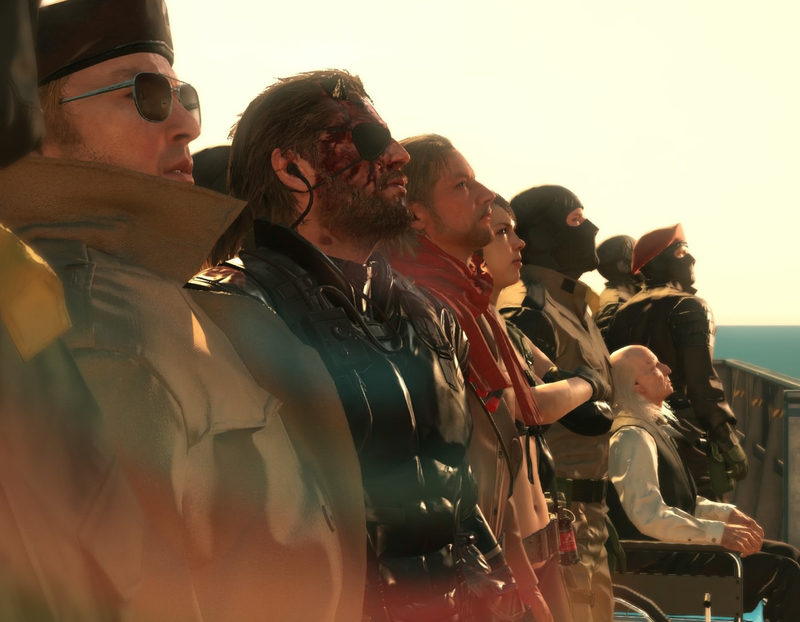 The beauty of MGSV is the perfection in which either plays out. Neither is weaker. Some games allow you to do things but it’s not quite how the game was designed so you can tell. Not here. If that enemy hadn’t been wearing a helmet, the entire side op would’ve turned out entirely differently. And that is why MGSV is the greatest game in a long time. And while I wait for Snake (Venom this time, though I always preferred the Naked moniker) to finish his tale, which inevitably must be anticlimactic, I’m enjoying a game that didn’t need to be made, but I’m oh-so-glad it was. And we’ll bid adieu to Kojima’s take on the MGS world…but it’ll be on a high note…again!